This second giveaway is for a book that I received during part of my time as an “official” Korea.net honorary reporter/blogger (July 2014). 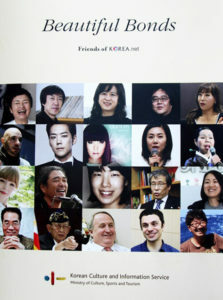 It is a 620-page book that tells the stories of 35 “Koreaphiles” who have helped spread Korean culture to a global audience. Interesting note: each person’s story is available in back-to-back chapters of English followed by Korean. So it’s a great way to practice your Korean by reading matching short stories (35 of them) about real people.